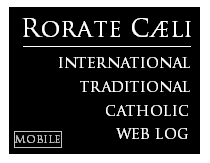 RORATE CÆLI: War on tradition not normal and must be counteredPriests and seminarians: “Why are you waiting to fight back? ""The Pope had hoped for a change ... but the diocesan curia, made up of ex-‘68ers, has allowed for nothing." 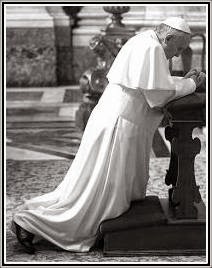 This has been the complete boycotting of the will of the Pope which was a simple act of justice: the Mass that the Church has celebrated for fifteen centuries and which made Saints cannot be abolished. Not even the awful lack of priests, which we have seen these past years, not even this will be able to liberate Tradition from its confinement. They would rather be without priests, they would rather close the churches, but they will not allow a traditional priest to celebrate the Mass of ages. Many priests were ready to pass to Tradition, many were seriously interested in regaining possession of that which is the greatest patrimony in the Church, many of them asked to learn the Old Mass. And what is to be said about seminarians? “If you love Tradition you are dangerous and are unable to be ordained in the Church,” this is the refrain from superiors of seminaries obedient to their bishops. A tremendous chill has thus fallen on a potential springtime for souls, first on the priests and then on the faithful. The Pope had hoped for a change of climate in the Church, but the old guard, nowadays in the diocesan curia, made up of ex-‘68ers, has allowed for nothing. Priests who love Tradition are closed up in a prudential silence and the seminarians in an “apnea” of conscience, so that they will be able to arrive at their longed for ordination, illusorily convinced that things will change once they are priests. Is all of this normal? Absolutely not, it is not normal in the Church! Are all those gentlemen who are hostile to Tradition and impede it with strange Byzantinism[s] still concerned about the salvation of souls? Do they still want [to promote] Christianity? Or do they aspire to something different? And if it so, why are they occupying the Church of God? They have been promoting a new religion with timorous references to the Christianity of the past. They have been working and spending a lot of money(!) in order to transform Catholicism into a religion fit for literary salons; they waste time in trying to restore a painting or commenting on a [literary] text, but they are absent in the field…they are not going into the confessional and they are not going up to altar every day, because they are [busily] engaged in some cultural project. Are they still worried about souls frequenting the Sacraments? Do they still deem the Sacraments necessary for salvation, or are they only concerned about creating “community” substituting the structure to the essential, that is, to God? 1. A leap of courage from all those priests and seminarians who are suffering on behalf of a Church increasingly hostile to its past. We would like to say to them: “Why are you waiting to fight back? Yes, fight back – so as to obey God!” Consider the effects of this Church badly modernized, consider the great sadness that it has produced and obey God joyfully. It is only in this way that you will serve the Church with love, because the Church is - Tradition. 2. An amendment in those who have had such hostility to the Traditional Mass and have imprisoned it. We realize that not all of them operate in bad conscience. To them we would like to say: “Let us have the experience of Tradition,” give us the churches, allow us to look after souls and then come in all simplicity and judge the fruits. You have given churches to the schismatic Orthodox, advertised even the times of worship for the Protestant heretics, when will you release the Mass of all ages from limbo? What would your old parish priests, your grandparents and the saints of over two thousand years of Christianity say? Forgive us if we have spoken to you with such frankness, we do not want to offend anyone but to stir up an awakening of conscience: in this dramatic situation, there is no time for ceremony. May the year 2014 remove the torpor of many sincere souls, through the grace of God and the prayers of many. Translated and adapted by Rorate Contributor Francesca Romana with emphasis added by Adfero.